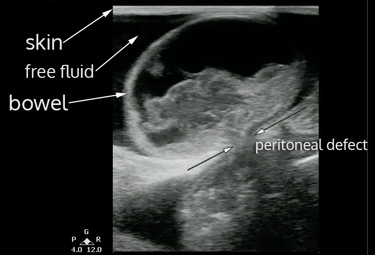 This ultrasound demonstrates a clear peritoneal defect with a loop of bowel penetrating through the defect. There does appear to be free fluid surrounding the loop of bowel. Although there is some blood flow present on color power doppler, peristalsis is absent in the incarcerated loop of bowel. Signs suggestive of strangulation on bedside ultrasound are: lack of peristalsis in the incarcerated segment, thickened wall (> 3mm), free fluid around the segment, and lack of blood flow on color power doppler. Based on this scan, the patient was taken to the operating room for definitive surgical management and repair of peritoneal defect. I am a emergency docter from the netherlands. i am really interested in abdominal ultrasound. Do you know great courses to learn this (a live course or great e-learning program)? 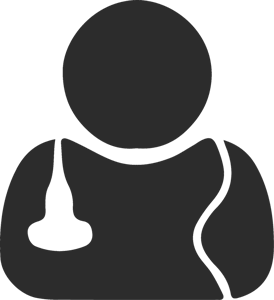 There are fantastic, free 5 minute ultrasound video clips available on 5 Minute Sono. I’m also a huge fan of Ultrasound Podcast. For more extensive online didactics + personal training, I highly recommend Ultrasound Leadership Academy. Finally, for an in-person experience close to you, check out Sonosweden or in the US: Yellowstone Ultrasound.